Since launching the RapidPakRx™ earlier this year, we’ve explained in great detail how this revolutionary strip packaging solution can improve patient adherence, reduce rework, and even help you compete against Amazon/PillPack, with the lowest operating costs in the industry. Those of you who’ve been lucky enough to visit the RxSafe booth at a tradeshow this year have already seen the RapidPakRx “up close and personal.” Now, for the first time, everyone can see the RapidPakRx system in action, with footage taken from a RapidPakRx customer pharmacy. The video below explains how the RapidPakRx can complete a 30-day med cycle in as little as 10 minutes by using up to 20 “smart” cartridges that dispense all oral solid medications, split tabs, gelcaps, and OTC supplements, without calibration or hand-filled trays. Adherence strip packaging jobs can be easily, quickly and accurately completed by following the process demonstrated in the video. First, patients drop off their prescriptions, or request pouch packaging for existing prescriptions. The technician then enters the data into the computer, prints labels and pulls the required stock bottles. The stock bottles are scanned for verification and the correct number of pills are counted using optical counting technology. Then, the “smart” cartridges are loaded and inserted into the slot indicated by a green flashing light. The job is run through the machine, utilizing the 23 built-in vision inspection cameras. The RapidPakRx’s unique, 3-step integrated machine vision verification system means one-pass workflow, unmatched accuracy, and significantly lower operating costs. The finished pouches are now ready for pharmacist review & verification. Finally, the adherence strip is rolled and placed in a convenient dispenser box and delivered to the patient. 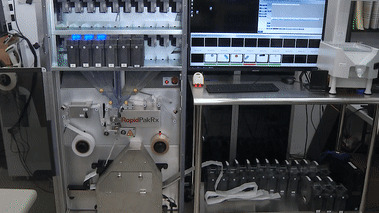 Would you like to learn more about the unparalleled adherence packaging technology of the RapidPakRx system? Visit our product page, or call 877-797-2332 now to speak with an adherence automation expert.